I wasn't going to put up a Stash Note today on account of having already posted yesterday but then I saw the beautiful fabric I received last week and I thought I really ought to share this with you today. 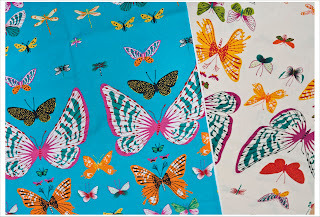 This is African Butterfly by one of my favorite Fabric Designers/Producers Alexander Henry. I bought the print in turquoise and cream and it is just wonderful. The butterflies are so vibrant and in particular in the turquoise colour. This print also comes in a black background that can be bought at Fancy Moon here in the UK. But I bought these two prints from Hawthornthreads.